Thank you Starbucks for offering the coffee grounds to we gardeners. I welcome the day when we all, homes and corporations can become zero landfill establishments! Nice tip. I went to a local Starbucks today to see if they had grounds for composting. Indeed they did, but not in handy pre-packaged bags. They kept the grounds in a tall kitchen trash can and I had an extra plastic bag and fllled that up. Perhaps at closing or if it is not too busy, they’ll let me take the whole thing. Don’t think they were “yelling” with the all caps, just a type choice. I think the words were meant to fill the yellow flower pot but somehow betweem the designer and printer the intention was lost. Absolutely. I’ve used Starbucks grounds in growing a variety of things, including burley tobacco–which I do not smoke. Just a hobby. The composted soil becomes rich, soft and textured. However, they should be composted before using with soil, unless they are used as a topdressing/sidedressing. 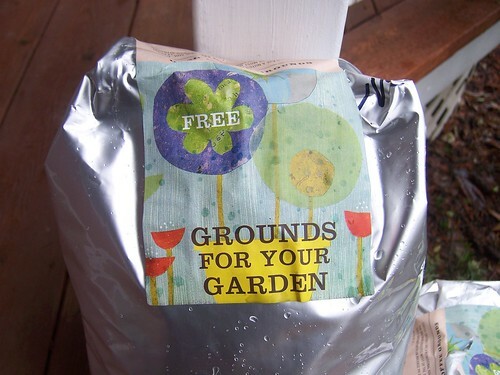 You can’t expect to plant seeds in raw coffee grounds. Warmer, most weather will break them down properly in fairly rapid time.